Posted on April 21, 2014 by Amanda Evans Posted in Crafts, Holidays, Homemade Recipes	. I am so “eggcited” how these eggs turned out! I’m a big fan of using real colors instead of artificial (like in my green play dough recipe or homemade bath paints). Here is how we naturally color our Easter Eggs each year. First I hard-boil a dozen eggs and let them cool completely before dying. No special magic here…whatever method you use would work just fine. I use regular store-bought white eggs since we don’t plan on eating them anyway. I can’t bring myself to use my precious pastured little guys for this. You can also use brown eggs, which will result in yet a different hue. The hardest part for me at first was planning out what I wanted to use for each color, as well as how to prep each “dye”. You can look it up until you become blue in the face since every site seems to call for something slightly different. So I eventually just stopped looking and thinking…and just went for it! Sometimes I become so dependent on following others’ ideas that I forget that I have a brain of my own. Note how some ingredients work “cold” (put right in a jar), while other mixtures require boiling to bring out the colors (aka “take longer”). I boiled five different natural dyes this time, so I had all my burners going at once followed by one on its own later. Here’s what I used for each color, then read on to see the story of each colored egg I made. 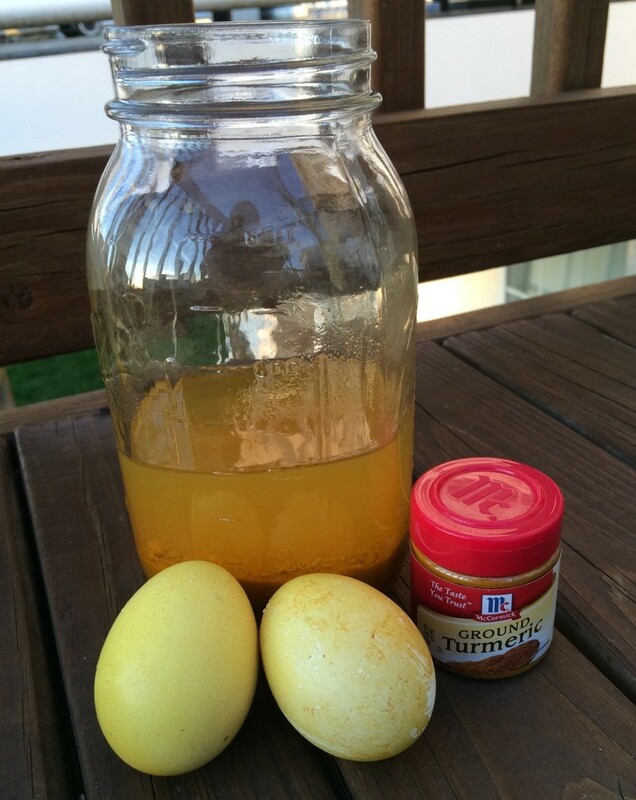 The gist is to place eggs in jars, cover with “dye”, add 2-3 teaspoons of white vinegar , and let soak in the fridge until desired color is achieved ( I did overnight, about 12 hours). I’ll start with my favorite egg of all…beautiful blue ones made from boiled red cabbage leaves (some people call it purple cabbage). I coarsely chopped a bunch of the leaves (the cabbage in the picture is what I had left, so I used not even half of the head?). Next, I covered them with about three cups of water in a pot and got it to boil for about 15 minutes. Then turn the heat down, cover, and simmer for 15-60 minutes until you reach the hue you desire. Your eggs will be lighter than your dye so it is best to aim for a darker color. Remove from heat and let completely cool before placing in a jar with your hard-boiled eggs. Add 2-3 teaspoons of white vinegar, mix, and leave in the fridge until desired color is achieved (I did overnight for 12 hours). -I haven’t tried any other natural blue dyes for this, but many sites also say canned blueberries can create blue eggs, as well as a lot of grape juice. A small amount of grape juice apparently makes lavender, as do boiled red onion skins or red wine! I didn’t have fresh blueberries on hand, but I did have a frozen bag of organic fruit which had blueberries. It also had blackberries so I threw those in, too. I covered about 1/2 cup of berries in a small pot with water (about another 1/2 cup) and allowed it to boil for 15 minutes. Then turn the heat down, cover, and simmer for 15-60 minutes until you reach the hue you desire. Your eggs will be lighter than your dye so it is best to aim for a darker color. Remove from heat and let completely cool before placing in a jar with your hard-boiled eggs. Add 2-3 teaspoons of white vinegar, mix, and leave in the fridge until desired color is achieved (I did overnight for 12 hours). -A red or purple grape juice may also be worth trying, but each brand is different. May turn out more pink-hued though. Turmeric never ceases to amaze me and provides the perfect shade of yellow for natural dying (love it in the homemade bath paints). I brought 2-3 tablespoons of ground turmeric and guessing 3 cups of water to a boil for 15 minutes. Then turn the heat down, cover, and simmer for 15-60 minutes until you reach the hue you desire. Your eggs will be lighter than your dye so it is best to aim for a darker color. Remove from heat and let completely cool before placing in a jar with your hard-boiled eggs. Add 2-3 teaspoons of white vinegar, mix, and leave in the fridge until desired color is achieved (I did overnight for 12 hours). -I’d imagine whole turmeric would work great as well! You could strain your liquid through a coffee filter before adding it to your dye jar, but I was too lazy. Seemed to work well even though the powder separates. I haven’t tried any other natural yellow egg dyes, but many sources say you can also use orange and/or lemon peels, as well as boiled carrot tops. Similarly to yellow, I used spices for my orange dye. I combined paprika and chili powder (about 1 tablespoon of each), although I hear either one works well on its own. So have about 2-3 tablespoons of spice(s) with about 3 cups of water boil for 15 minutes. Then turn the heat down, cover, and simmer for 15-60 minutes until you reach the hue you desire. Your eggs will be lighter than your dye so it is best to aim for a darker color. Remove from heat and let completely cool before placing in a jar with your hard-boiled eggs. Add 2-3 teaspoons of white vinegar, mix, and leave in the fridge until desired color is achieved (I did overnight for 12 hours). -This orange did not come out as well as I hoped. Maybe I shouldn’t have used both spices? Or perhaps should have strained the liquid through a coffee filter before adding it over the egg, but that didn’t affect my similarly-done yellow egg. This year I’m trying cooked carrots or freshly pressed carrot juice (since they sure do stain my juicer and cups well!). I used carrot juice in the past to make orange icing for my son’s first birthday cake and those bath paints, so I will give that a whirl next year. I read you can also use a lot of boiled yellow onion skins. This was another tough one. I did not have fresh spinach, so I used frozen spinach, about 1/2 cup of spinach leaves under 1/2 cup or so of water. I allowed that to boil for 20 minutes. Then turn the heat down, cover, and simmer for 15-60 more minutes until you reach the hue you desire. Your eggs will be lighter than your dye so it is best to aim for a darker color. Remove from heat and let completely cool before placing in a jar with your hard-boiled eggs. Add 2-3 teaspoons of white vinegar, mix, and leave in the fridge until desired color is achieved (I did overnight for 12 hours). Since my spinach water wasn’t green, I thought I would try putting kale through my juicer since it always stains my cups and teeth when we juice it. I poured that right over my egg, mixed with a couple teaspoons of vinegar, and let it dye overnight with the others. It made a beautiful green color in the jar, of course, but really didn’t stick to the egg at all. A few spots became speckled green. -I think I’d need to boil the kale the way I did the spinach. Just using kale juice works great for icings, playdoughs, bath paints, etc…but not for sticking to the egg shells. BUT…kale works great to color homemade green play dough! In other good news…that was the last of my boiled dyes. The rest are even easier! My first thought was pickled egg here, so I opened up a jar of canned beets. We ate half with dinner and I placed a hard-boiled egg inside the rest of the beet juice (I left a few beets too, for good measure). I added 2-3 teaspoons of vinegar, mixed, and let dye overnight in the fridge (about 12 hours). -Success! I think it made a beautiful pink egg, but for some reason as it dried it became polka-dotted. I like it though! Other sources say cranberries/juice, raspberries, or red grape juice can make pink eggs, too. I wasn’t very sure about red, since all that beet juice only makes a pink. So how to get a deep red? I thought cherries, which I didn’t have, but I did have a can of expired cherry topping that I was going to get rid of. So I was bold, opened it up, and stuck a hard-boiled egg in there. I poured in a little bit of vinegar too, thinking it would help hold the color, and let it dye overnight in the fridge (about 12 hours). -I love the color this can of cherries made, although it isn’t a deep red. I read that lots of boiled red onion skins, pomegranate juice, or raspberries may make a dyed red egg…and will try one of those soon to update. I wasn’t sure what color I was going for here, but since I kept coming across placing eggs in grape juice to make various hues of blue/purple…I wanted to try it. I didn’t have grape juice though. I had a store-brand pomegranate-blueberry juice, so I poured some in a small jar, added a hard-boiled egg and some vinegar, and let it dye overnight in the fridge (about 12 hours). -When I first removed the egg to dry, it was a nice berry color, but it dulled as it dried. It resulted in a slate-like color, had little bubbles on some parts, and marbled effects on the other. Although this isn’t as “natural” as the other ingredients I used, I thought it’d be a fun experiment and would love to try other juices in the future. When I was a teacher, we placed eggs in coffee for a February Dental Health Month lesson to demonstrate how the coffee stains the eggs/tooth enamel. We had fun brushing it off later (as should coffee-drinkers), but it was the perfect solution to dye my egg brown now. I poured a cup of prepared coffee over the egg, added some vinegar…and even threw in the coffee grounds for the heck of it. Fridge, overnight for 12 hours, and voila…a perfectly stained brown egg. -Not sure what else you’d want to use here…or why I didn’t just buy an already brown egg. Doh! But, the coffee smelled delicious and hubby got the leftovers, so no harm done. Once your eggs are dyed to your liking, remove from containers to dry on a metal rack. Some of my eggs dried differently than they originally looked. Once completely dry, you can shine them up with coconut or olive oil (or any oil, really) to give them a great gleam for looks. You could dye your eggs for shorter, or longer, than I did. I wouldn’t mind letting them dye for a couple of days actually to make extra vivid colors. Play around with adding more or less vinegar, writing on eggs with a wax crayon (just like the “real” egg dye kits), and maybe even washing the hard-boiled eggs in a little soap first to make the shell perfectly clean/smooth. I can’t guarantee that I’ll naturally dye my eggs every year, but I am glad to give it a whirl while we can. This taught me so much about natural colorings that I use in many of my posts. And our family had a “hoppy” second Easter together that year! So, what do you think? 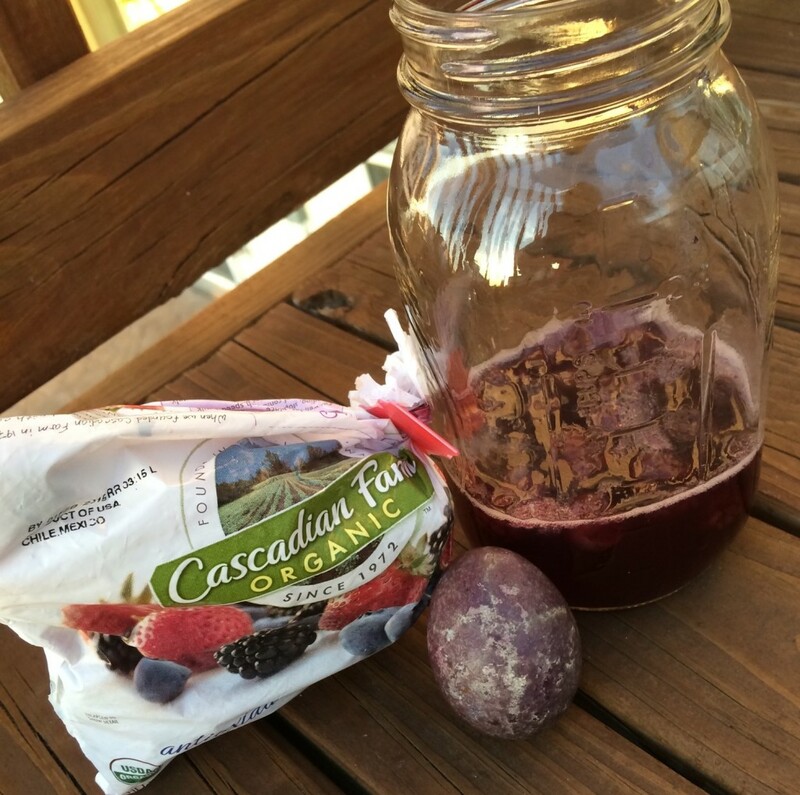 Will you try this natural dye for Easter Eggs sometime? 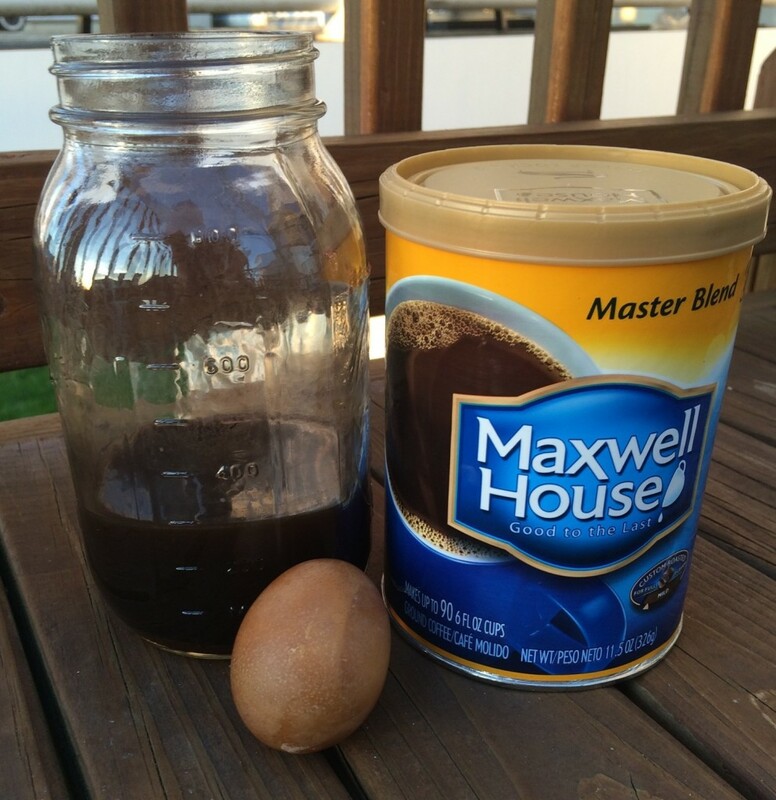 Do you already use natural dyes for eggs or other foods? If so, I’d love to hear about it. Please comment below and find me on Facebook and Pinterest for more fun ideas! This post was one featured as part of the Blogger 52 Project. Tags: color, dye, easter eggs, food coloring, natural	. Thanks for stopping by! Sorry for such a delayed response and break from my blog! This is way cool! I especially love the way the pink came out.